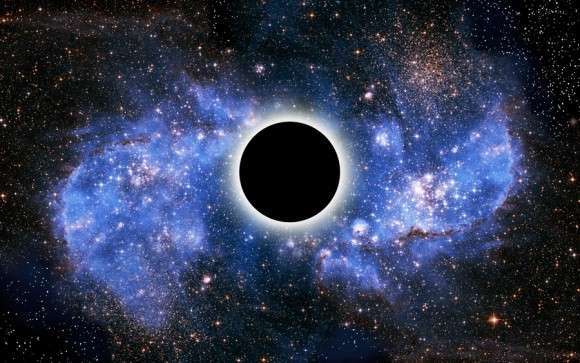 The very idea that a black hole could have a temperature strains the imagination. I mean, how can something that absorbs all the matter and energy that falls into it have a temperature? When you feel the warmth of a toasty fireplace, you're really feeling the infrared photons radiating from the fire and surrounding metal or stone. 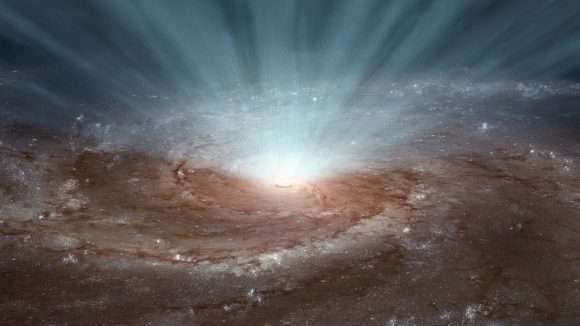 Now, supermassive black holes can shine with the energy of billions of stars, when they become quasars. When they're actively feeding on stars and clouds of gas and dust. 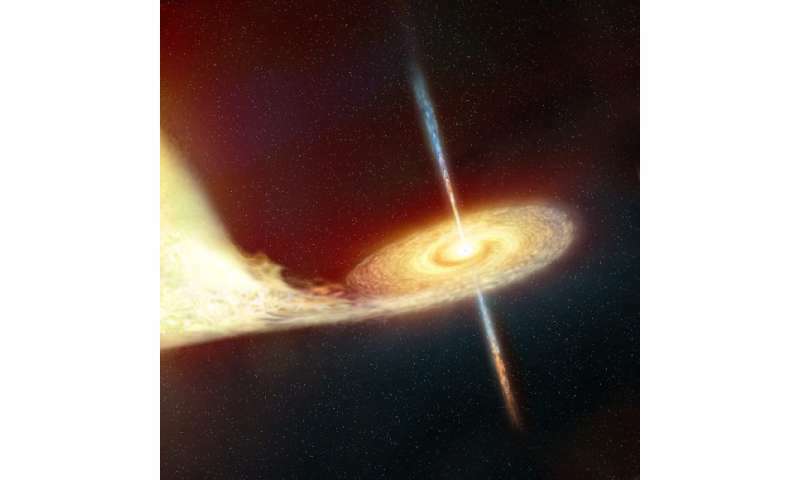 This material piles up into an accretion disk around the black hole with such density that it acts like the core of a star, undergoing nuclear fusion. But that's not the kind of temperature we're talking about. We're talking about the temperature of the black hole's event horizon, when it's not absorbing any material at all. The temperature of the black hole is inversely proportional to the mass of the black hole and the size of the event horizon. Think of it this way. Imagine the curved surface of a black hole's event horizon. There are many paths that a photon could try to take to get away from the event horizon, and the vast majority of those are paths that take it back down into the black hole's gravity well. 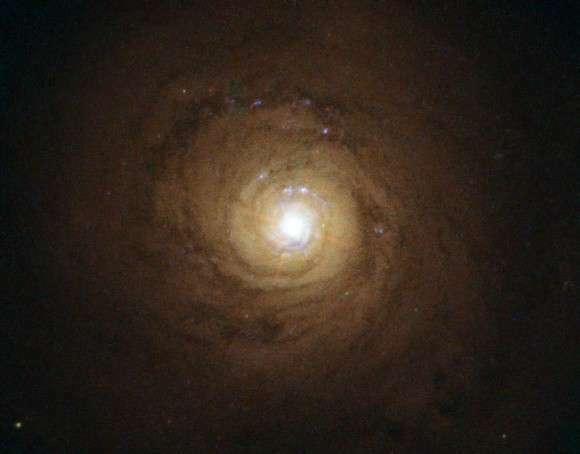 Since energy is being released into the Universe at the black hole's event horizon, but energy can neither be created or destroyed, the black hole itself provides the mass that supplies the energy to release these photons. A solar mass black hole might have a temperature of only .0.00000006 Kelvin. We're getting warmer. Since these temperatures are much lower than the background temperature of the Universe – about 2.7 Kelvin, all the existing black holes will have an overall gain of mass. They're absorbing energy from the Cosmic Background Radiation faster than they're evaporating, and will for an incomprehensible amount of time into the future. Until the background temperature of the Universe goes below the temperature of these black holes, they won't even start evaporating. Only a black hole with about the mass of the moon is warm enough to be evaporating faster than it's absorbing energy from the universe. A black hole with half the mass of Vesta would blaze at more than 1,200 Kelvin. Now we're cooking! It took them billions of years of evaporation to get to the point that they're starting to explode now. It's pretty crazy to think that an object that absorbs all energy that falls into it can also emit energy. Well, that's the Universe for you. Thanks for helping us figure it out Dr. Hawking. "And black holes absorb all the energy falling into them. There is absolutely no infrared radiation coming from a black hole. No gamma radiation, no radio waves. Nothing gets out." Author: On April 18, 2016 Stephan Hawking in a news conference flatly denied what I quoted you as stating in this article. Several news outlets picked it up including New York Times, Smithsonian, and yes. even this site. But, the charade must continue? How about anyone else posting here? How many of you have read what Hawking said at the news conference? Those who haven't should simply go to a search engine and request articles for Hawking's most recent BH Comments, you'll be stunned, in essence he doesn't believe they exist.